Matilda turned 11 today. Our beautiful, kind, loving, smart, artistic, musical, bookworm, minecraft loving daughter is 11. She still lets me do her hair in the mornings, she still crawls into our bed on the weekend for a "morning cuggle" and she asks me every night if I am ok.
We had a party down at the Country Club pool, 9 of her friends for pizza and a swim. We all came home exhausted! 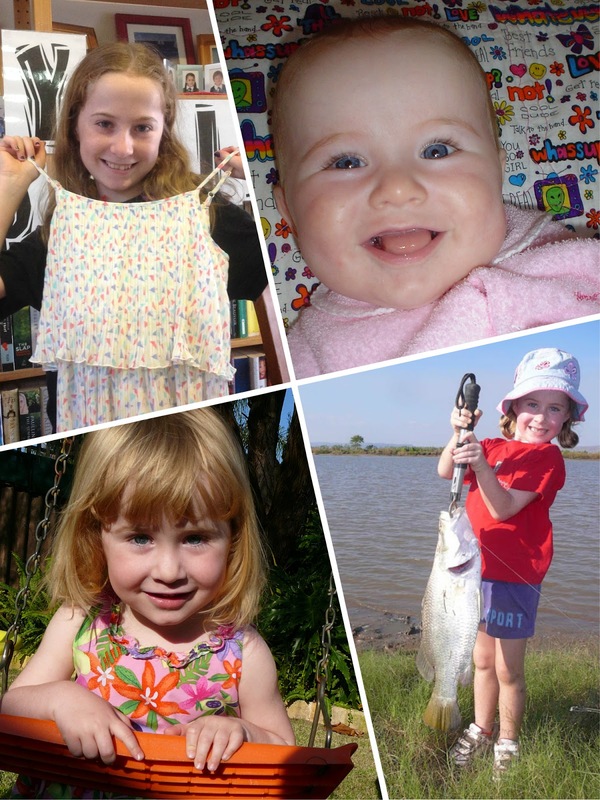 Happy birthday Milly Moo! I finished the quilt top over the weekend. I'm very happy with how quickly it has come together and how effective it looks. It inspired me to sandwich it immediately and I have already started quilting it since taking these photos this morning. I had to get some purple fabric out of the purple fabric draw this weekend and look what I found folded up neatly in a zip lock bag at the back of the drawer? My bocks received from Bee FF 2012.. 2012?? 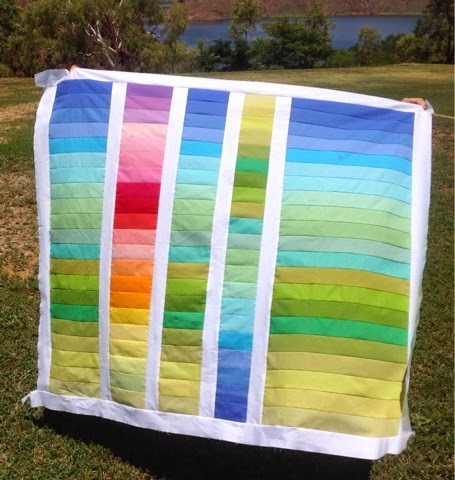 A friend's wife at work has just had their second daughter, I think I will sash it with 1 inch white strips and wolah, baby quilt! I had a lovely mail day yesterday. This lovely, lovely, lovely bundle of thread arrived in the mail. 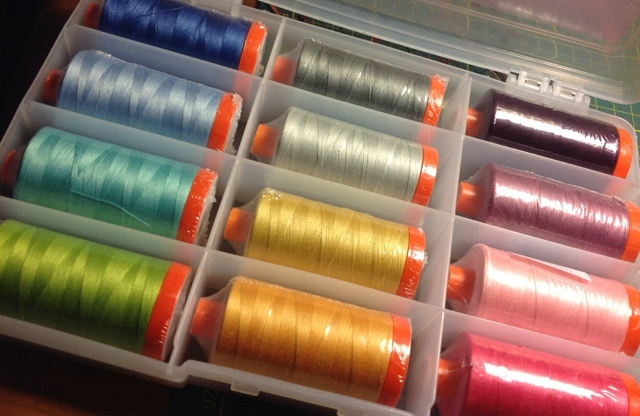 12 reels of Aurifil. It's the "Simply Colour" Collection. Soooo pretty! Well after getting annoyed by my walking foot issues and goggling and sniffing around the internet I thought that maybe it was the fact I was using a spray adhesive to sandwich my table runners was causing the grief. 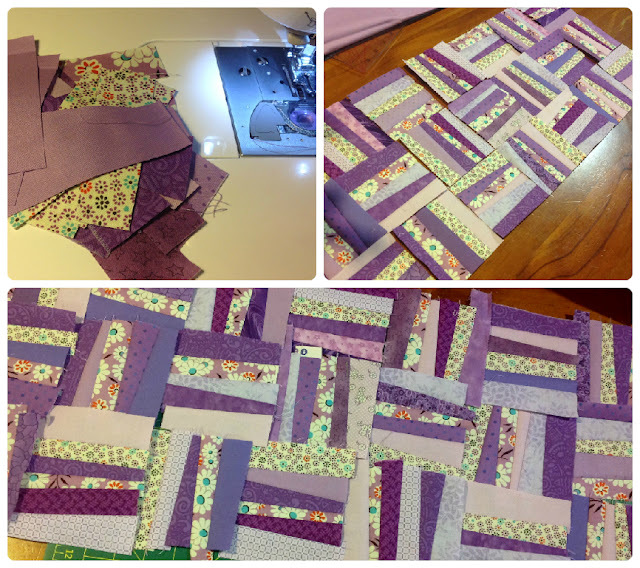 So I sewed together some more scrappy squares to make into another table runner. 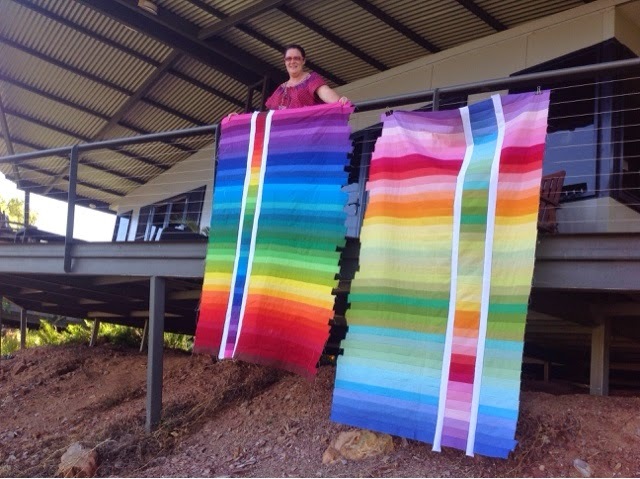 I do have two cot sized quilts ready to sandwich but I didn't want to do my experiment on them. 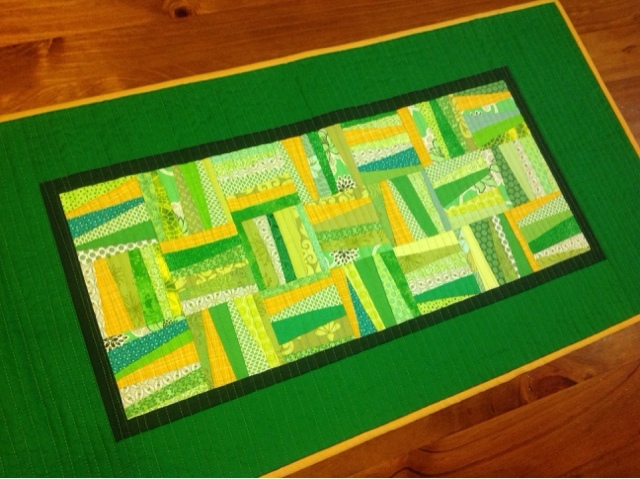 Once I had the squares done it was quick to cut them down to 3.5 inches and then sew them all together, that is actually a deep green as a border, not black as it looks in the picture. So all ready to go and I got out the pins and pinned away! Then, new needle in and away we went and surprise, surprise, still skipping! Arggg! So I took out my King Tut thread I was using and decided to try my green Aurifil thread instead. Well, that was better, only skipped once in a row instead of five times with the King Tut. But by now I'm back to thinking its my walking foot because when I was piecing the top of this runner, not one single skipped stitch! So I took the @#$%%=*!! walking foot off, unpicked the five rows I had just done and replaced it with an open toe foot and started again. The result? Absolutely perfect. Go figure! Pressure dial on the back of the machine - 1. Upper thread tension - 4. Bottom thread - King Tut. 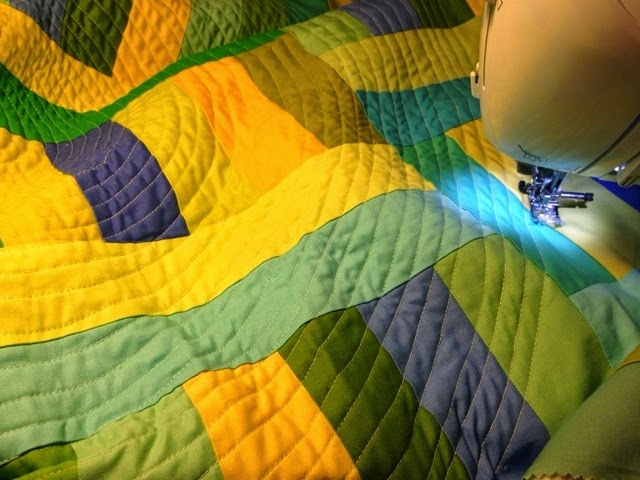 Direction of quilting - Down, pivot, back up, pivot, down etc. It was a long weekend here last weekend and the husband took off for a three day trip with the boys to Melbourne to watch some games of footy *yawn* which equals a whole lot of uninterrupted sewing time! A friends Mum is visiting and it was her 70th birthday shortly after the weekend, so what better pressure to set myself than a deadline of the weekend to sew a table runner as a birthday pressie? So with her favourite colour noted - can you guess what it was? 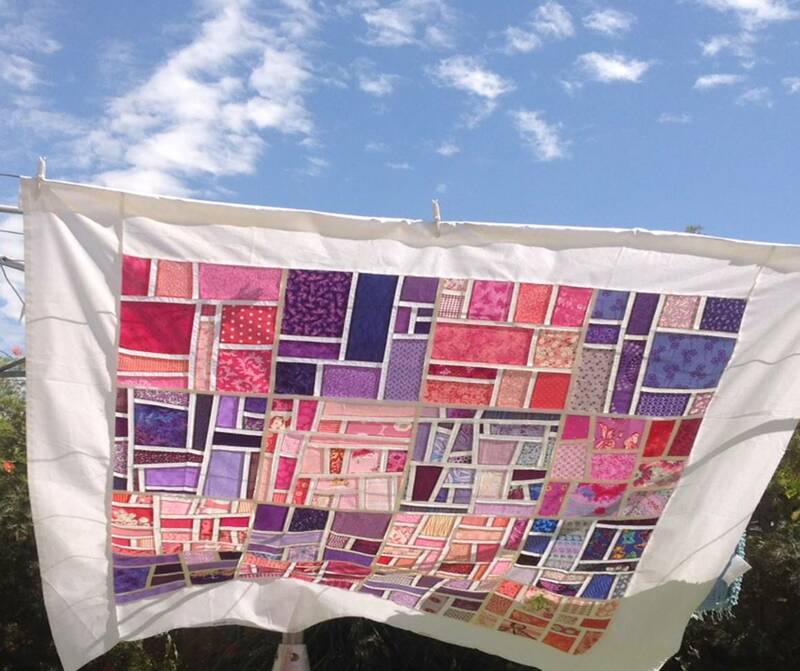 - I set up the ironing board in the kitchen and popped a new needle in the machine and away we went! 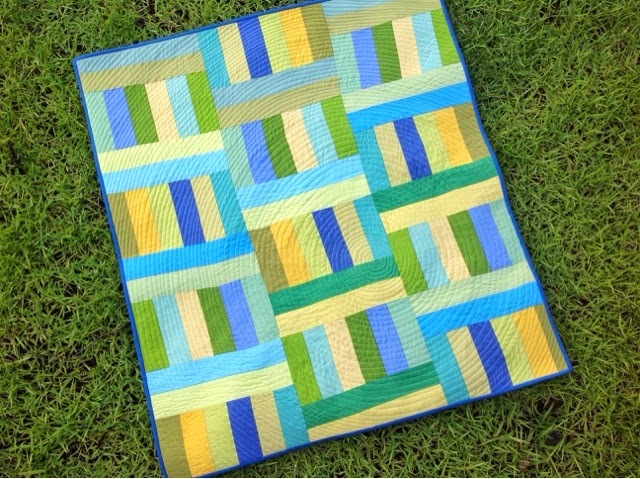 It had to be a simple design and I took inspiration from my green/blue/yellow lap quilt and cut up wedges of purple and sewed them into roughly 5 inch squares, then I trimmed them down to 4 inches trying to make sure I had a wedge of the Dennis Schmidt fabric I purchased in San Diego in each block. 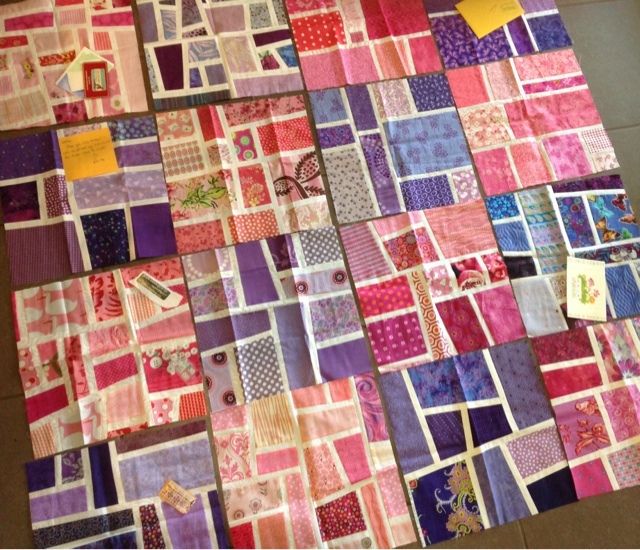 18 blocks later I was ready to sew it all together and sandwich it and get quilting. Here is where the grief commenced. 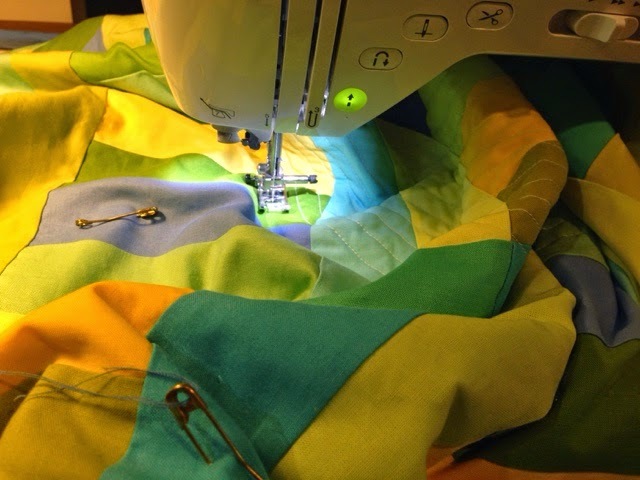 I popped on my new walking foot that arrived back in March, put a new needle in the machine and started sewing, my usual straight up and down quilting style. After about the sixth row, the machine started skipping stitches. At first just one a row, so I slowed down, then the next row it was a few more skipped stitches. Odd I though. So I stopped, rethreaded the machine and continued, still skipping stitches. So I stopped again, cursed, changed the bobbin, rethreaded again, checked the needle was in properly and went off again. Guess what? Still skipping! More cursing, I took open the bobbin case and cleaned out all the dust, replaced the needle. rewound a new bobbin and started again. Still skipping!! I was getting to the stage of chucking my machine against the wall by now. The weekend was drawing to a close, I wanted this finished, so I took off the walking foot and unplugged the naughty machine, put it on the floor by me sewing table and got my other machine out, popped the walking foot on that and continued away. No skipped stitches now but a gradual pulling down of the fabric..... Why is that? It is sewn with a walking foot, it should be even, it is a small runner, I hold it up as I sew, there is very little drag. 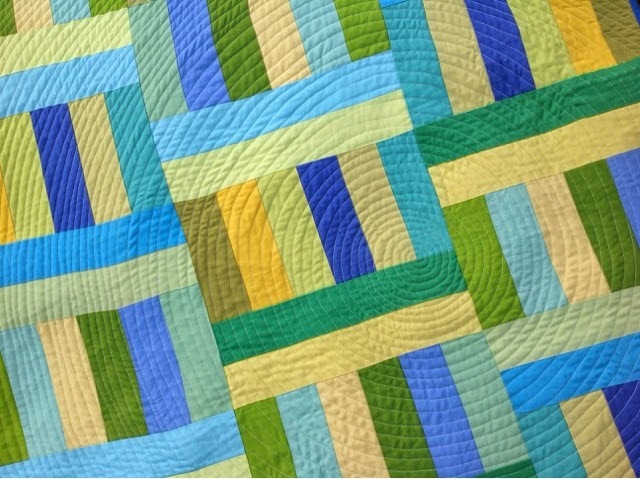 I know some people suggest you should go up and then down when quilting like this but to be honest I don't like the little zig zag effect it has on the edge of the border. But maybe that zig zag is better than this huge pull?? I'm going to do another runner like this and then experiment, up and down and also sew one on my friends Bernina, maybe it is my machine in general? I ended up gifting the runner to my friends Mum, she didn't notice it. Meanwhile my naughty machine is still sitting on the floor in time out. I have bit of a head cold at the moment so yesterday I stayed home from work, popped myself on the couch and sewed down the binding for this table runner. 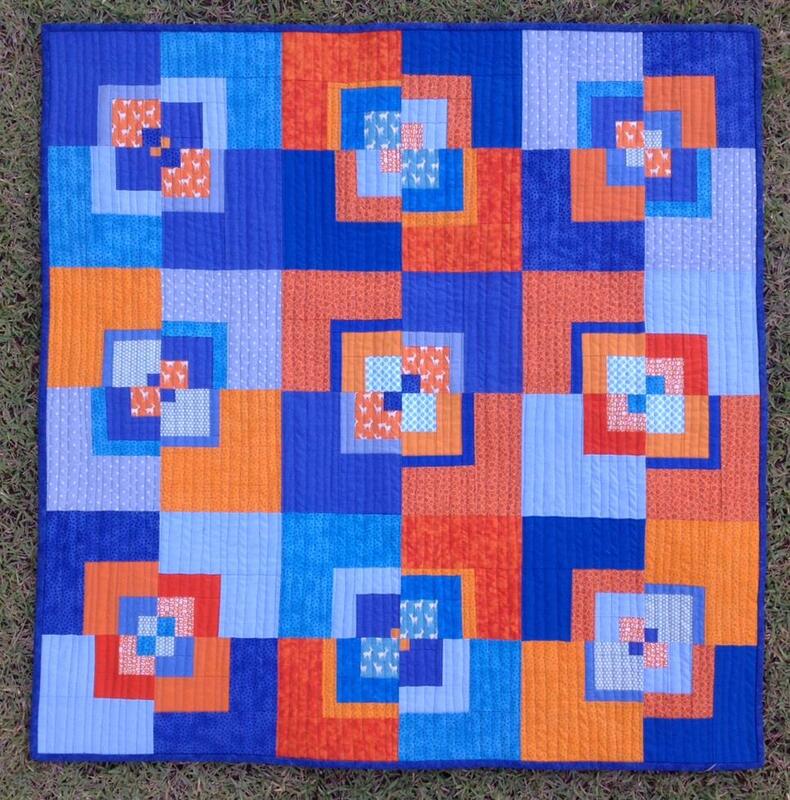 It is made from mini charm squares, I like to slice them in half and sew them together at quiet times. 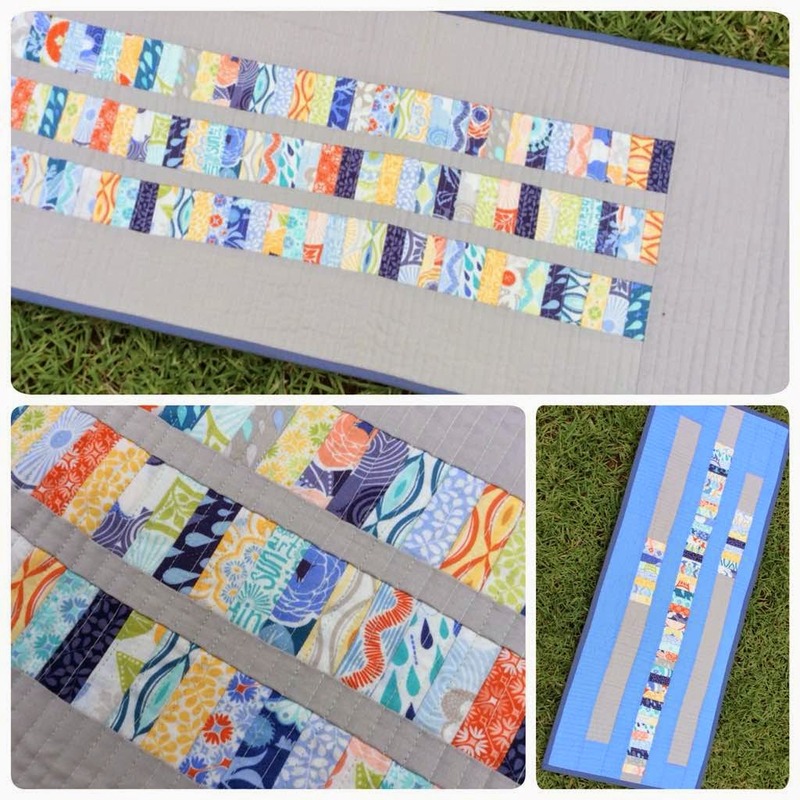 They make a quick table runner! So here is my luggage for a one night/two day quilting retreat. That's not bad is it??! 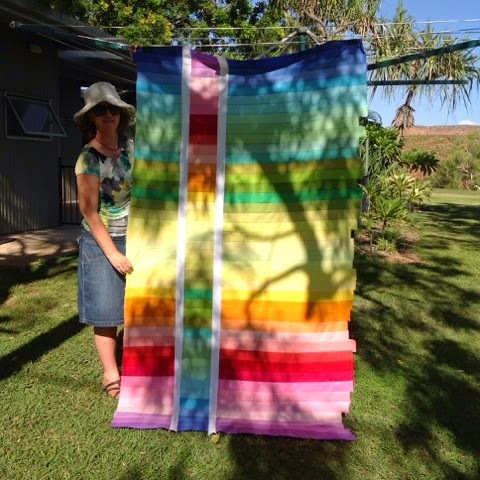 I have my ironing board, bathers, extension cords and lots of fabric, so I'm all set! This is what the view from my seat looked like for most of Saturday. 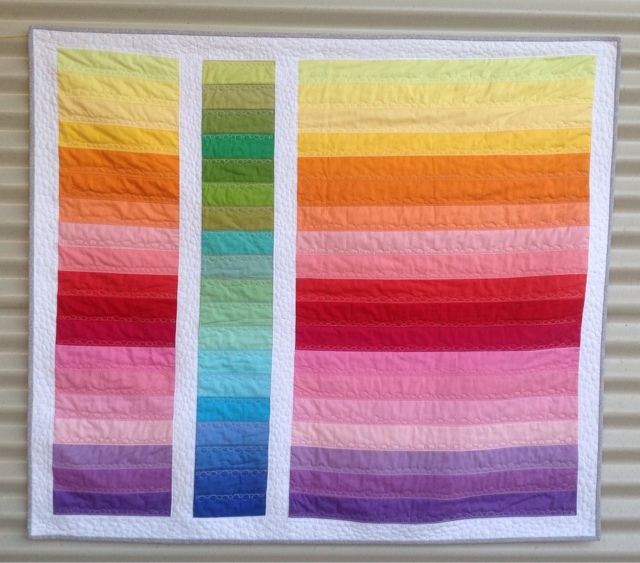 A friend wanted to make a quilt like this one and so I decided to make one with her. 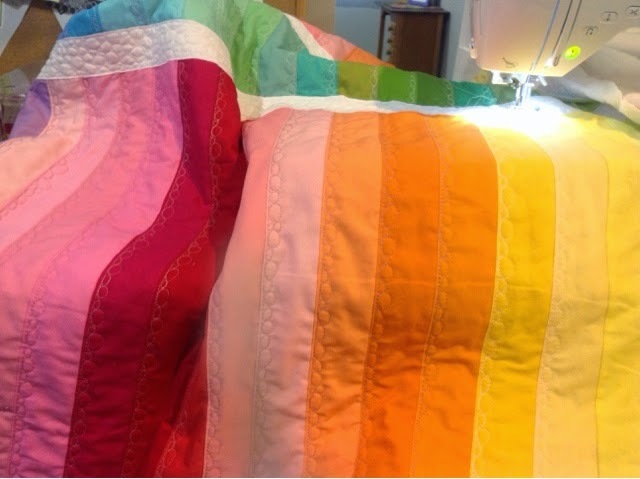 I said to my friend, now be really careful when you unroll your jelly roll, you don't want to get the colours out of order, leave them exactly how they are and sew them in that order. So off she went like a good little girl and sewed them all exactly as they were when they were unravelled. Meanwhile I sew a few of mine in order and then think, oh that green would look better down there and that blue should really be over there. So I started messing mine all up and kept on sewing. It was bit of a weird blend, there was only one true red and heaps of yellowy/greens. 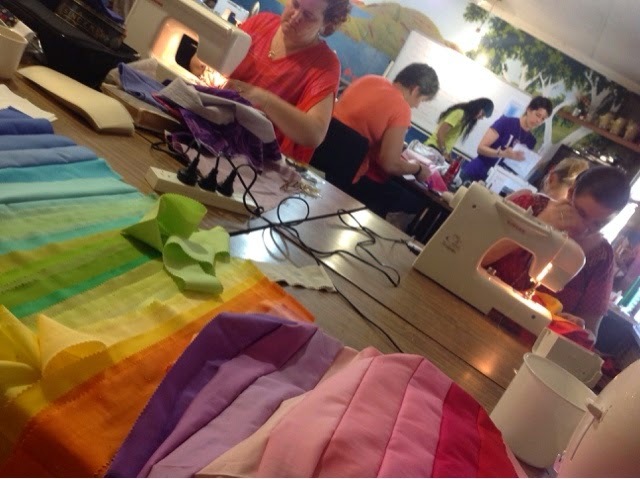 I should have pulled a few out, but I was in the zone and kept on sewing. Even the beautiful location couldn't shake that feeling. Maybe I should quilt a tree over the top of it?? Instead I fold it up and get to work on something else. That night I get out ipad and look at the photos and for a 40 minutes have this in-depth discussion with my room mate about what I could do to make this quilt better. 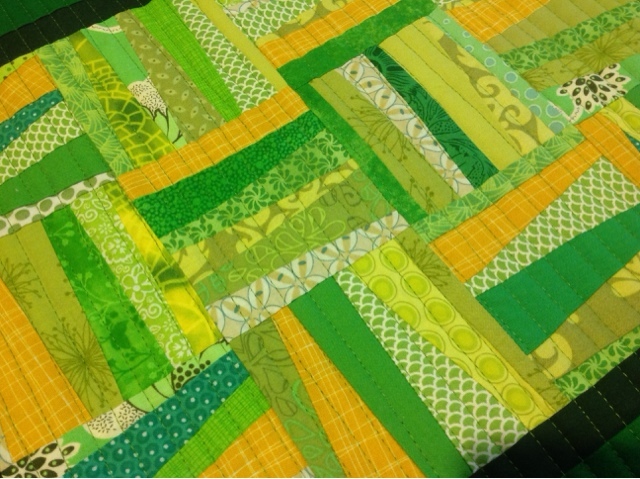 We discussed unpicking the green/yellow bit, but no too tricky with the white sashing. 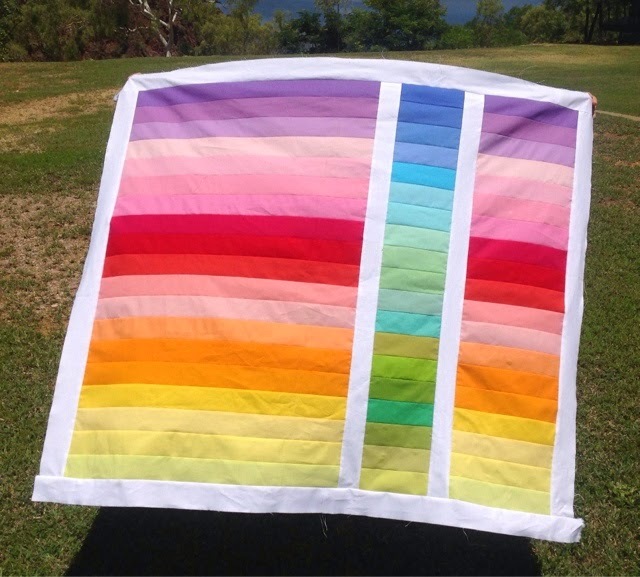 We discussed rainbow squares around the outside with a thinner white sashing? 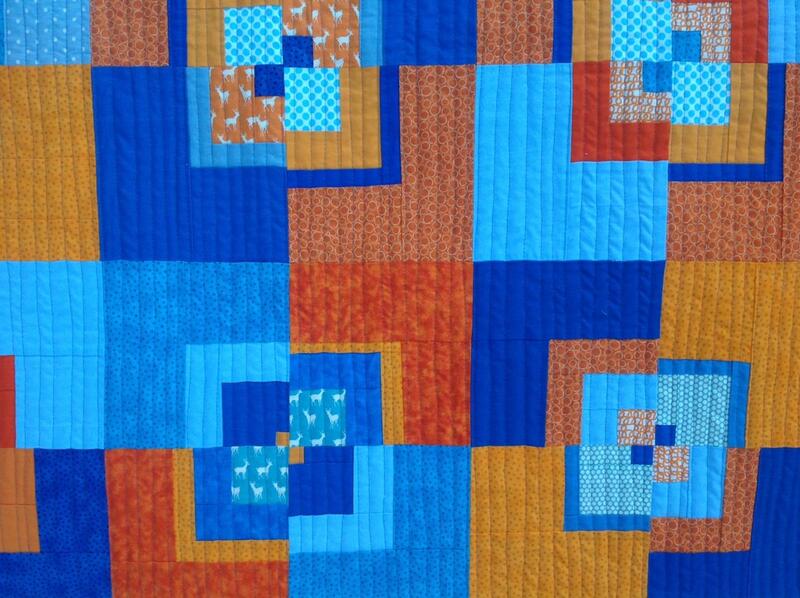 We discussed quilting options to make it pop. And then in a moment of frustration I said, I may as well just chop the thing in half. That was the lightbulb moment! 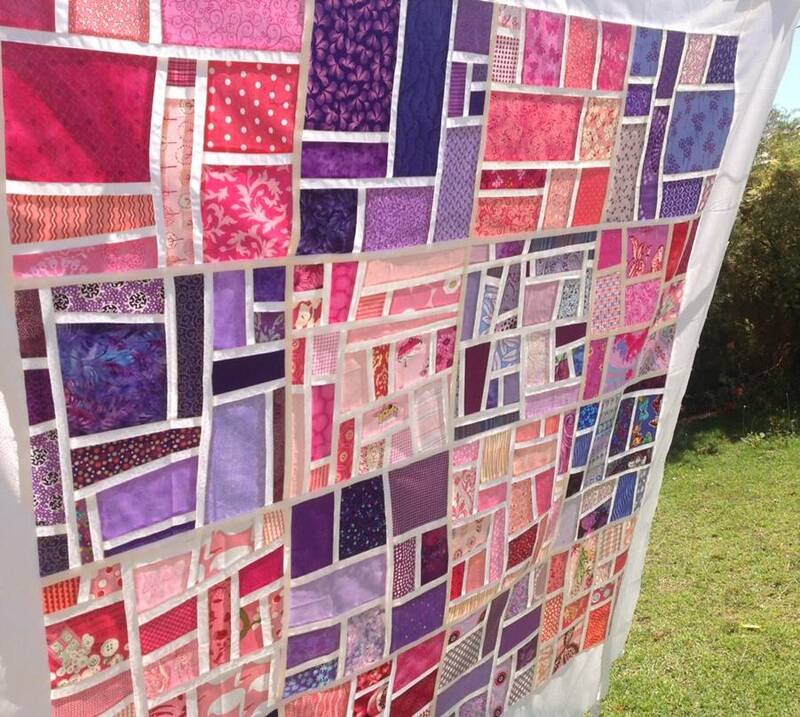 Chop it in half and make two smaller quilts. The first was easy. Just a simple chop and then add the white around the edges. Perfect. Quilt number one finished. 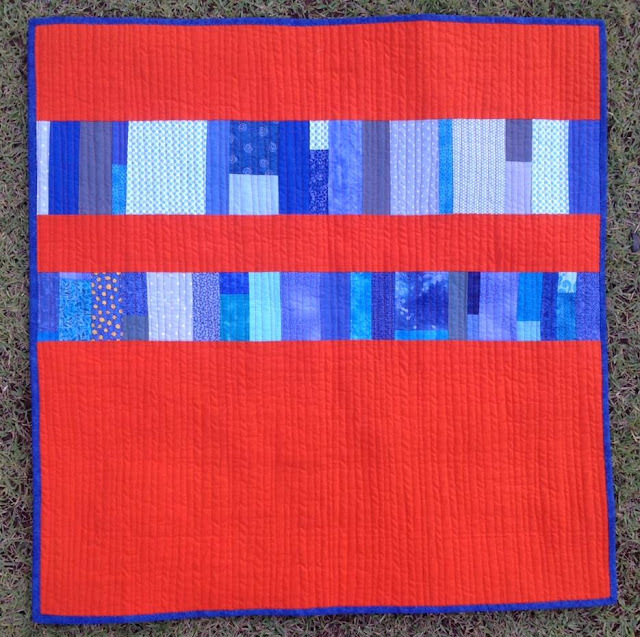 Very happy quilter now. 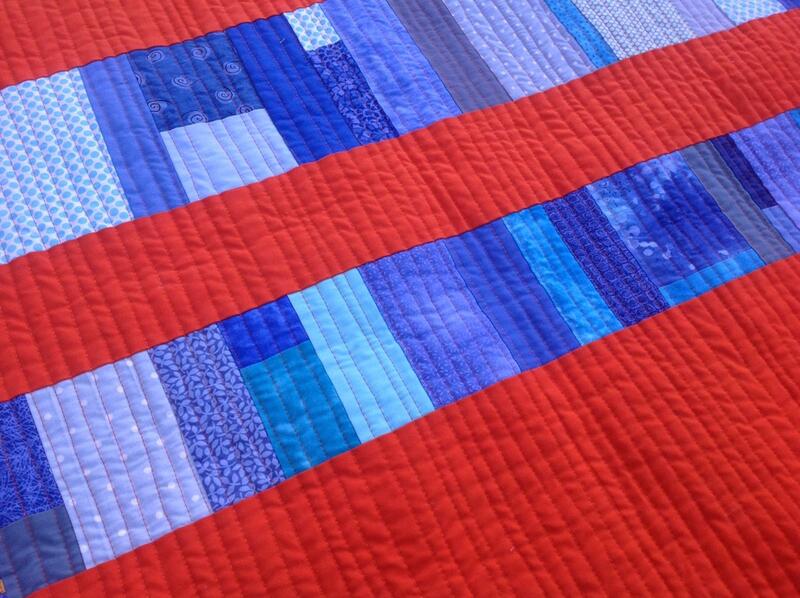 Quilt number two needed a little bit of something else. So I did another cut and rotate and sew back in with white sashing. Looks like a landscape. Quilt number two finished. 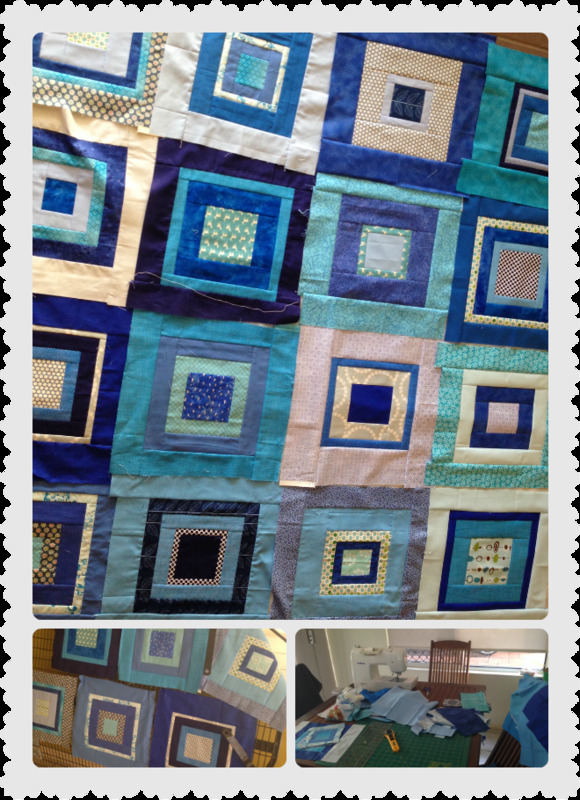 An extremely happy quilter indeed now! Here is the whole gang with all their work for the weekend. 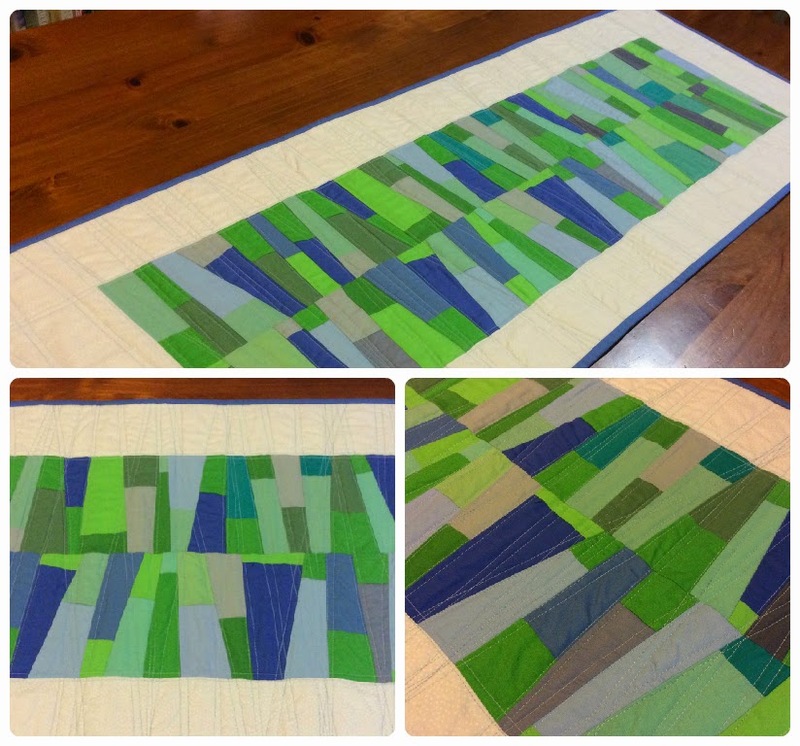 A Finished Quilt in March? 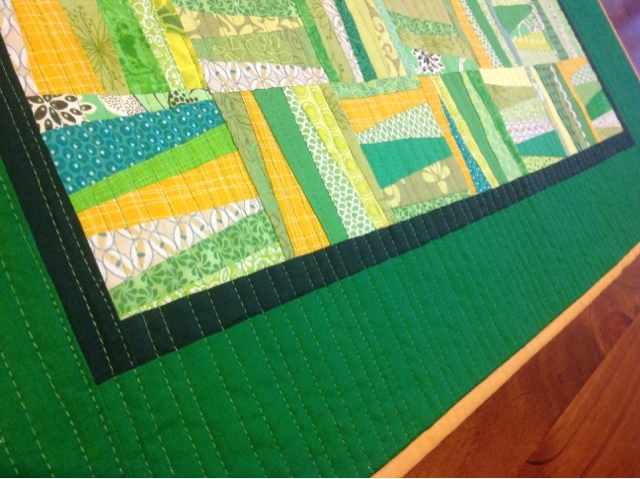 Well the retreat is this weekend and I have finished the sample quilt for the Jelly Roll Race. The machine quilting has pulled it a bit. I must learn to love my walking foot then this wouldn't happen! I love the texture though. Bring on the weekend! There is nothing like a deadline, a long weekend and a husband away on a 48 hour fishing trip to get the sewing juices flowing again! 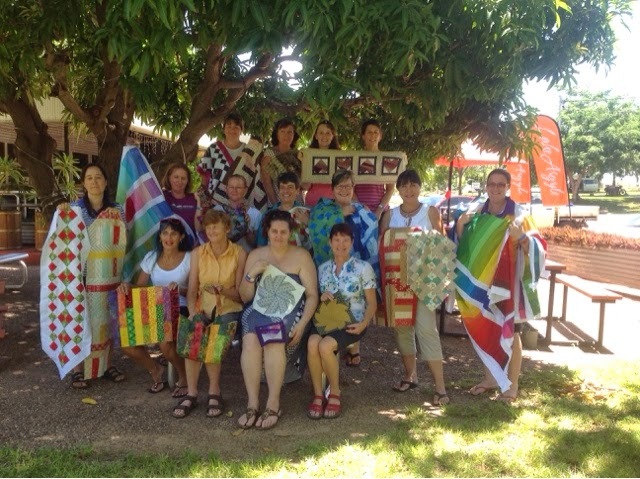 Next weekend I am off on a Quilting Retreat, it is to the same place with the same ladies as last year here. 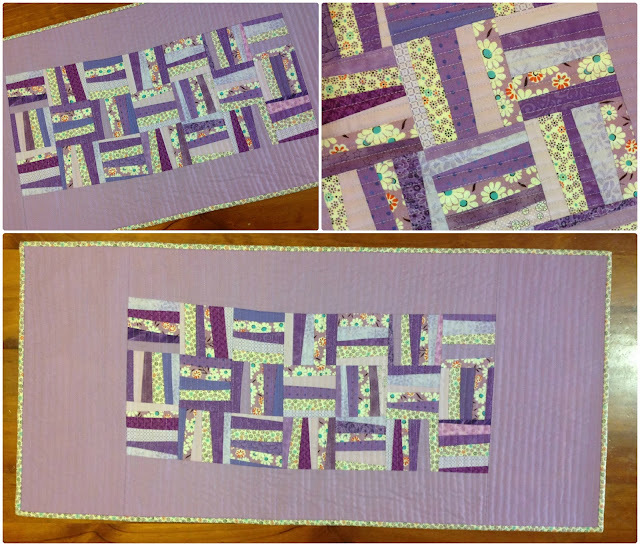 I put my hand up and said I would host the jelly roll session and so I will be walking the ladies through making the Jelly Roll Jam 2 Quilt from the free pattern section of the fantastic Fat Quarter Shop. So I "had to" make a sample to show them next weekend. It came together pretty quickly and I was down on the floor with my pins sandwiching it together before I knew it. 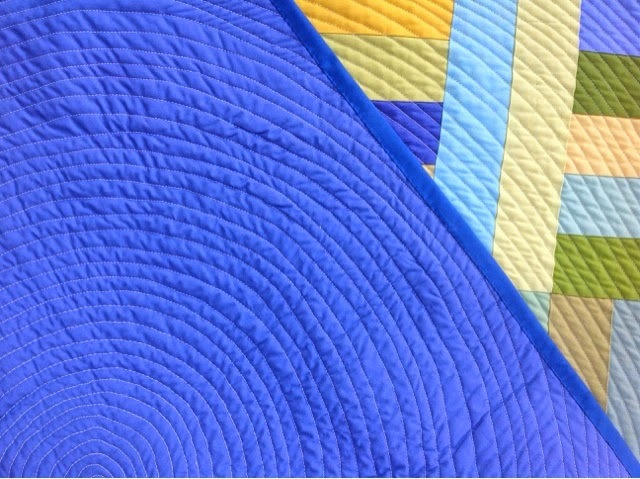 Even though its a very geometrically pattern, I thought I would do a big circle spiral quilting pattern, just for practice. I really like the effect it creates. So I marked a starting point, put the darning foot on and away I went. Anti clockwise. I didn't realize then I'd be up for a d'oh moment soon. I did the first five ripples of the circle then changed over to my open toe foot, I just can't fall in love with my walking foot, I get better results with a normal open toe foot. So another ten ripples later and I notice I am getting really bunched up at a certain curve in the neck making it a bit tricky to push through, it was supposed to get less bulk in the neck as the circle got bigger, not more. Then the d'oh moment hit me, I should have gone in a clockwise direction. 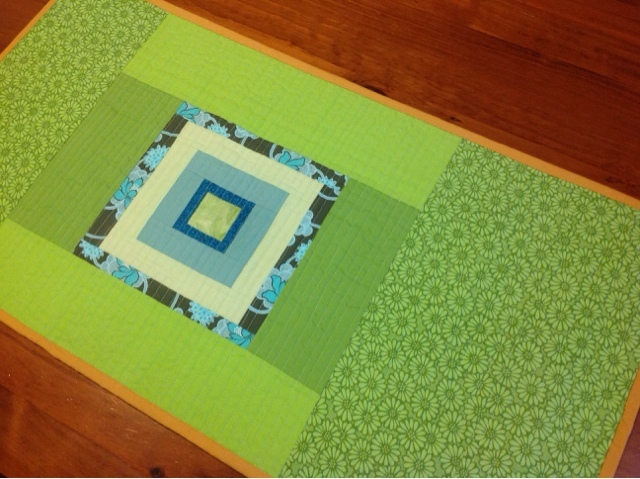 But I continued on till the quilting reached an edge and then I flipped it around in a clockwise direction. I've just got the binding to go now. Tomorrow is a public holiday here in WA so I'll get it done in no time. Who said blue and green shouldn't be seen? They wouldn't be comfortable sitting down at my dining room table at the moment! 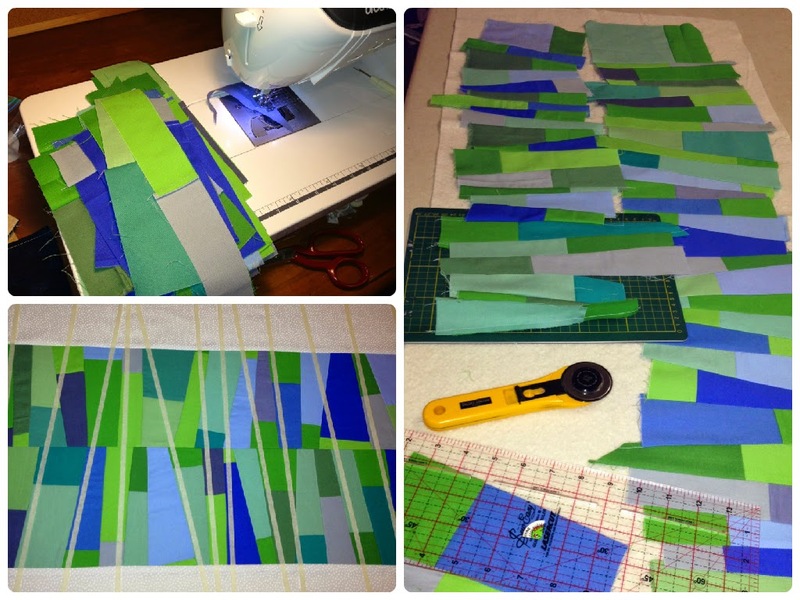 A few weekends ago I gathered all my blue and green solid scraps from my scrap basket. It was starting to look like the sea in there, time for a cull. So I cut them into rough rectangles and then sliced them into a wedge shape. All random, just mix and match. I was trying to make them about 8 to 10 inches long to be trimmed down to 8 inches. 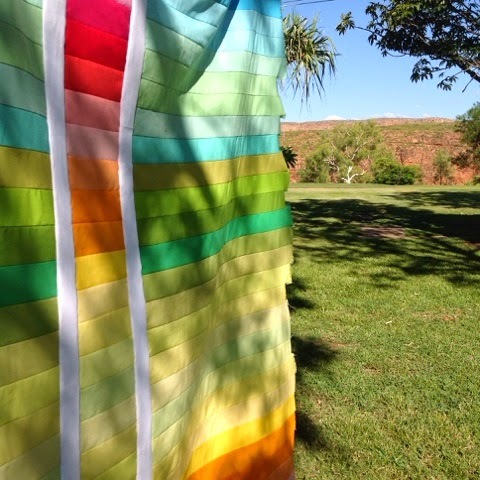 I was thinking of a white 1 inch sashing in-between the two lengths but then when it came to laying out the two strips they looked good just butted up. Trimmed off the excess and then sewed it together, added a crisp white boarder and then wolah, top complete. I didn't want to do straight across back and forth straight quilting, so I thought I'd try quilting following the angles of the seams. It measures 18 by 47 inches. Wonder how long the white will stay white on our table? I'm pleased with it and even more pleased that I finished something for 2015! So after the wedding, we woke up the next day, returned the dress and tux to be collected from the concierge dude and then packed our bags and jumped on the plane to head back to Los Angeles for the last leg of our trip. 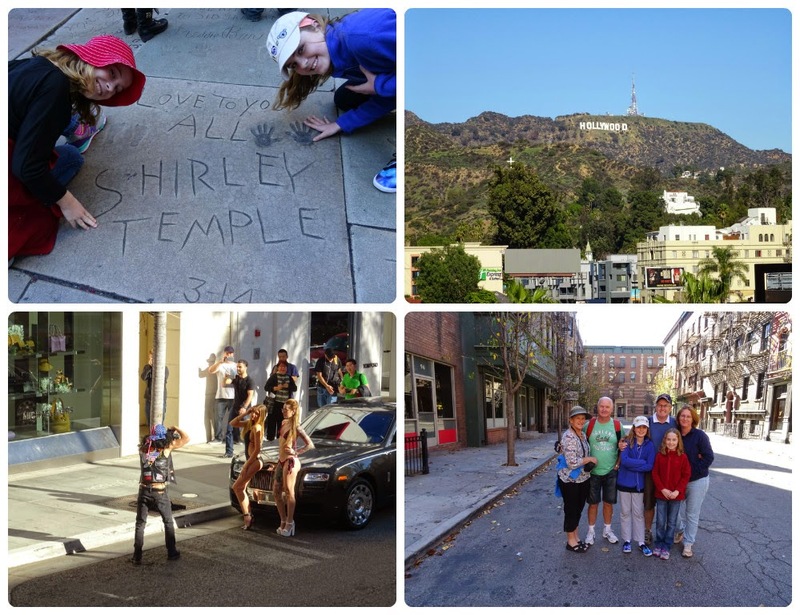 We stayed in Hollywood, a few blocks back from the Walk of Stars strip. Didn't like the strip so much, was full of people hassling you for tours all the time. We did one of those Hop On/Hop Off bus tours one day and that gave us a good view from the top deck of all the antics on the streets below. That was as close as I wanted to get. We did the Warner Brothers Studio tour which was pretty good. Sat on the Friends couch, saw where Ellen parks her car. 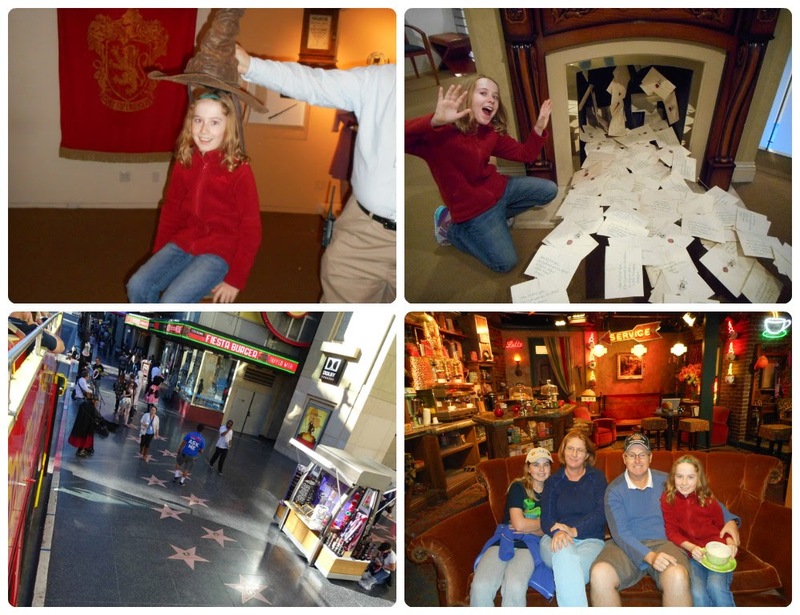 They had an awesome collection of props and costumes from the Harry Potter movies on display. Milly and I are big Harry Potter fans so that was the highlight of the day for us. 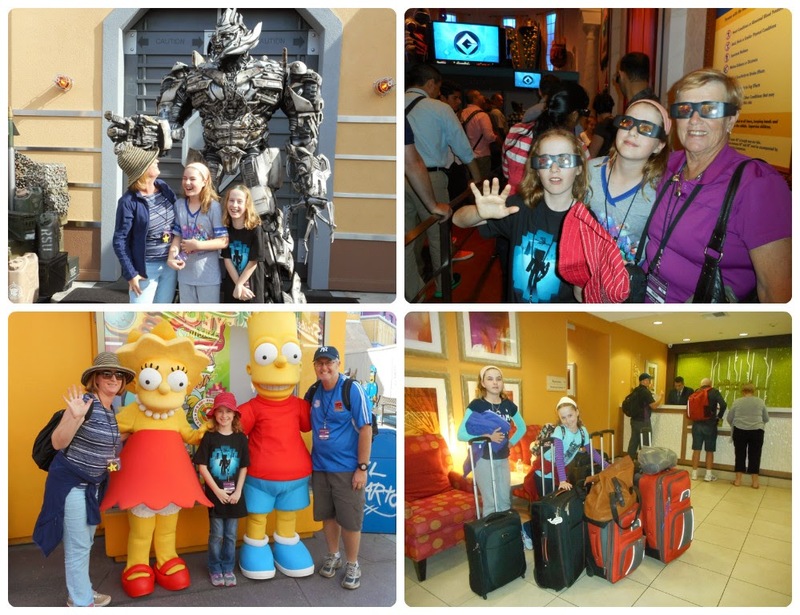 We also did a day at Universal Studios. It was a lot like the one in Singapore but that was okay by us as we had a great time last year there! There was a slight delay in getting in as there was a problem with our paperwork, so after 25 minutes of debate at the ticketting window, the only way we would get in would be to pay again. Which we did and kept all the paperwork so we could get a refund when we got back to Australia. It was an amazing holiday, lots of wonderful memories.